After a wonderful morning group ride on Saturday morning and a day of making dreams come true in the shop I decided to grab one more very quick short ride for the evening. What was supposed to be a quick and easy ride over to a surprise wedding celebration party for Kyle and Gail, turned into a rather interesting trip. 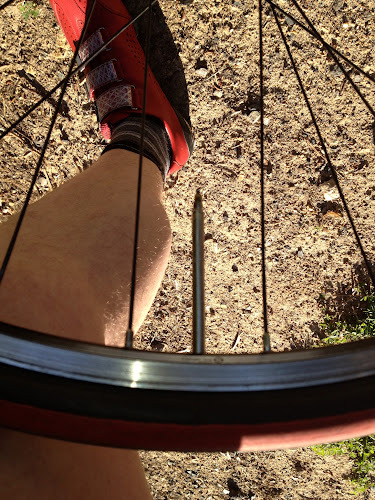 One mile into the 3.3 miles from the shop to the party, I startled a couple of motorcycle riders who where sitting outside someone's house chatting it up when my rear tire hit a piece of gravel from said someone's driveway. 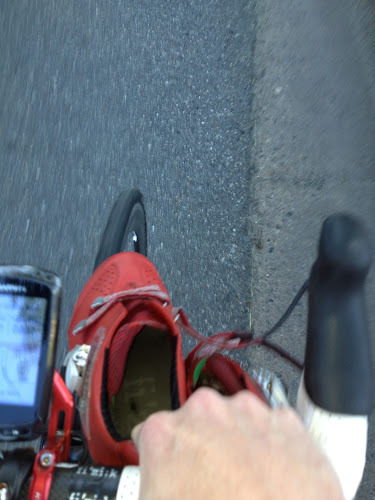 With the sound of a fully pressurized tire releasing all of it's contents back into the atmosphere instantly, I began to fishtail for a split second before bringing the bike to stop for a quick tube change. During the install of the new tube, I did a VERY quick visual check of the tire. Knowing that I hit that rock and the simultaneous BOOM!, I knew it was a pinch rather than a puncture. The check was a bit too quick however because I missed the fact that the rock placed a small cut in the sidewall of the tire. The new tube went it "fine" and allowed me to ride another 50 feet before going down once again. My ride had now turned into a walkabout. The remainder of the weekend was spent searching for a lost iPhone which was inadvertently left at the scene of the walkabout rescue, socializing with friends, attending my first ever baby shower, gardening and a trip to Williamsburg for Memorial Day with Mr and soon to be Ms Thin Mint. I hope everyone was able to enjoy their long weekend while remembering the day off from work is one more of the freedoms our soldiers have and continue to fight for us to keep. Thank you to all of those who have served in our military! Newer PostWill I have a crew?